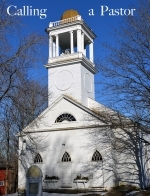 In June of last year I retired from the pastorate of Amoskeag Presbyterian Church after twenty-one and a half years as its pastor; I helped to plant the church in 1997. One of my tasks during the months leading up to my retirement was to help the church, and especially the session, prepare for a transition that few in the congregation had ever been through. One of the best resources I discovered was “Guidelines for Congregations to Follow in Discovering, Evaluating and Calling a Pastor.” It is a very useful document produced by a subcommittee of the Committee on Home Missions and Church Extension at the request of the Forty-Third (1976) General Assembly of the Orthodox Presbyterian Church. As many of my generation are nearing retirement age, these resources will become increasingly important. Among the many other fine resources that I discovered was the recent experience of the session in Syracuse, New York, in calling a pastor; this proved invaluable. Elder Jonathan Looney was kind enough to reflect on the process and finally to write the lead article in this issue, “When It Is Time to Call a New Pastor.” Our session found the most helpful book, among a number that are available, to be the one that Elder Looney reviews, Chris Brauns, When the Word Leads Your Pastoral Search. The title tells it all. Steve Migotsky reviews a very important new book by Maryann Wolf, Reader, Come Home. Wolf is the director of the Tufts Center for Reading and Language Research and explores the effect of the digital environment on the reading brain, concluding that it unsuits us for deep or close reading of substantial texts. This warning has been sounded for many decades. Witness Sven Birkerts’s 1994 book The Gutenberg Elegies. I review a new anthology of classic devotional poetry by Leland Ryken in his The Soul in Paraphrase, a line from a George Herbert poem. This beautifully published volume is one every thoughtful Christian will want to own. I also review Jonathan Kline’s Keep Up Your Biblical Hebrew and Greek in Two Minutes a Day. This third-generation linguist provides a wonderful tool for busy ministers to stay fresh in the original languages of God’s Word. The Soul in Paraphrase by Leland Ryken, ed. “On Calling a Pastor.” (G. I. Williamson) 6:2 (Apr. 1997): 26–27.